You can use either the slider to choose the portion of the available space to encrypt, or enter the desired size directly into the box to the right. The minimum size is 1 MB, the maximum is only restricted by the available free space on the USB drive and by the limitations of the operating system. What size you should choose depends on how you are going to use the USB drive: do you want to use it only to store the encrypted files, or do you want to be able to put unencrypted files on it, too? If it's the former, select all allowed space to be used for the Virtual Encrypted Disk. In the latter case, only a portion of the disk to encrypt and leave enough room for the unencrypted files. The portion of the slider displayed in the blue color indicates the available free space on the host drive. It shows the maximum size of the Virtual Encrypted Disk that can be created on the host disk. If you want a larger portion of the host drive to become available for encryption, you need to move some files out of the host drive, before encrypting it. Finally, the option Split the host file into segments offers you more control of how the Virtual Encrypted Disk is stored on the host drive. Normally, you don't need to change this option: it will be automatically selected for the FAT/FAT32 host drives, and deselected for the NTFS and exFAT drives, as needed. If you have a good reason for the host file to be split in segments even on the NTFS or exFAT host drives (an example of such a reason could be if you plan at some point to move the Virtual Encrypted Drive to another host drive, formatted with FAT or FAT32), then you are free to select this option. In such a case, choosing the largest segment size offered (2GB) is preferred, because it would reduce the number of the segments that USBCrypt software would need to keep track of. 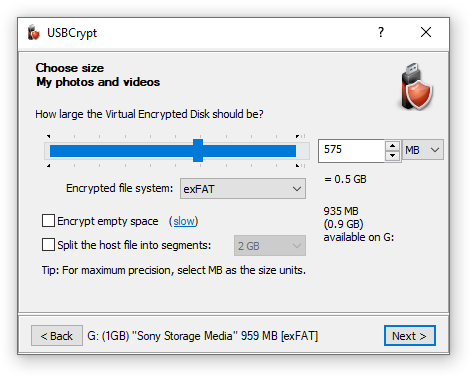 If this option is not selected, then USBCrypt uses a single file to store the contents of the Virtual Encrypted Disk. This setting is recommended if the host drive is formatted with the NTFS or exFAT file systems, which allow for virtually unlimited sizes of the files. However, if the host drive is formatted with the FAT or FAT32 systems, such systems cannot store files of 4 GB or larger size. If you create a Virtual Encrypted Disk of 4GB or large size, then the host file must be split in smaller segments (2GB or smaller each). To accommodate for such a situation, this option becomes automatically selected (and you cannot deselect it) if the host drive is formatted with the FAT or FAT32 file system.